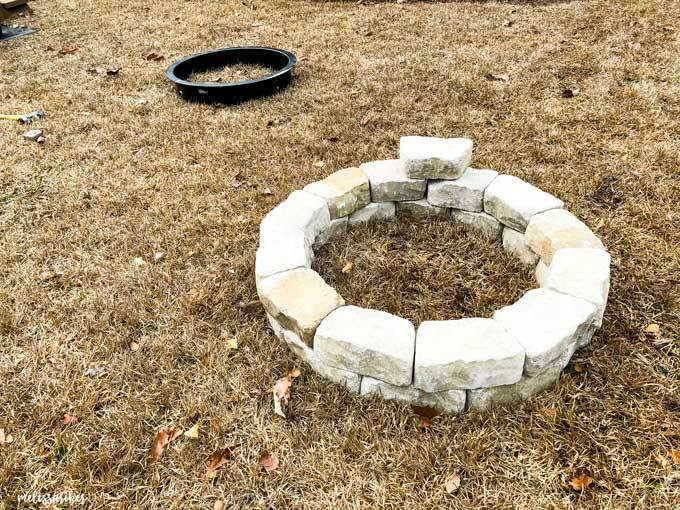 How to Build a DIY Stone Fire Pit | Under 2 Hours of Work! 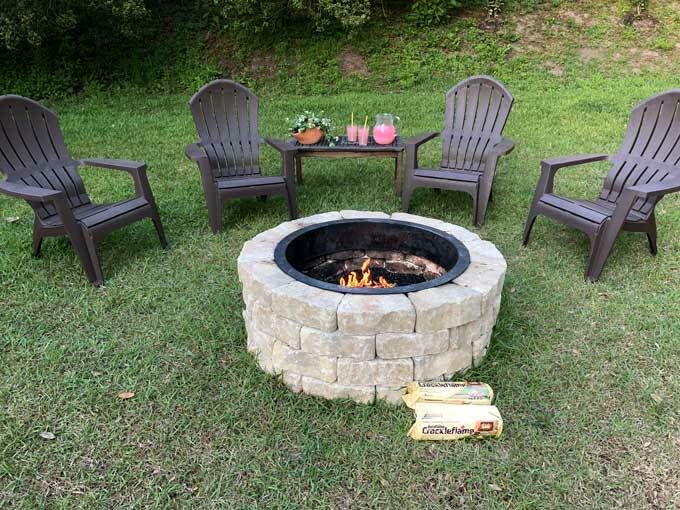 Thank you to Duraflame® for sponsoring this DIY Fire Pit Tutorial, as always, all opinions are my own! I’m so excited to share one of our recent yard projects with you all today! 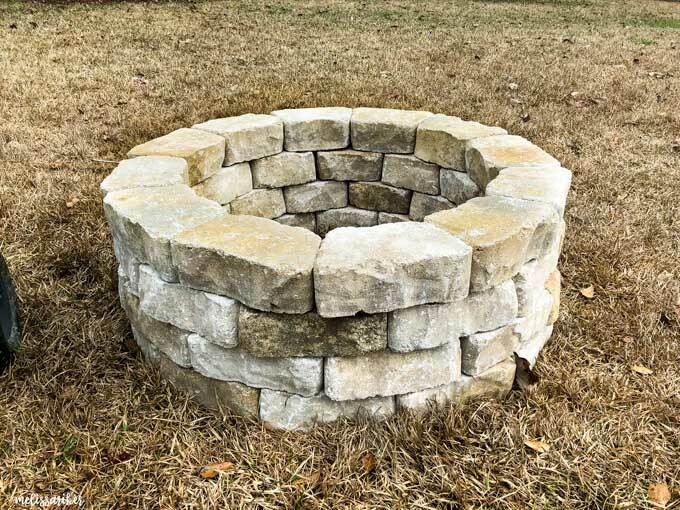 This DIY Stone Fire Pit we built last month just before the spring weather finally arrived and it’s been getting so much use already. 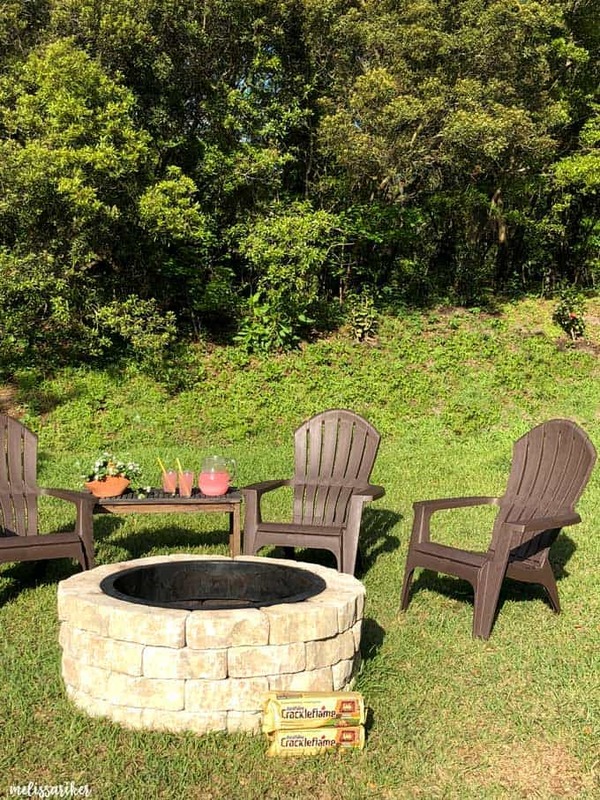 Over the years as the military has moved us house to house we’ve used an inexpensive metal free-standing fire pit for all of our outdoor get-togethers (which we love to do!) 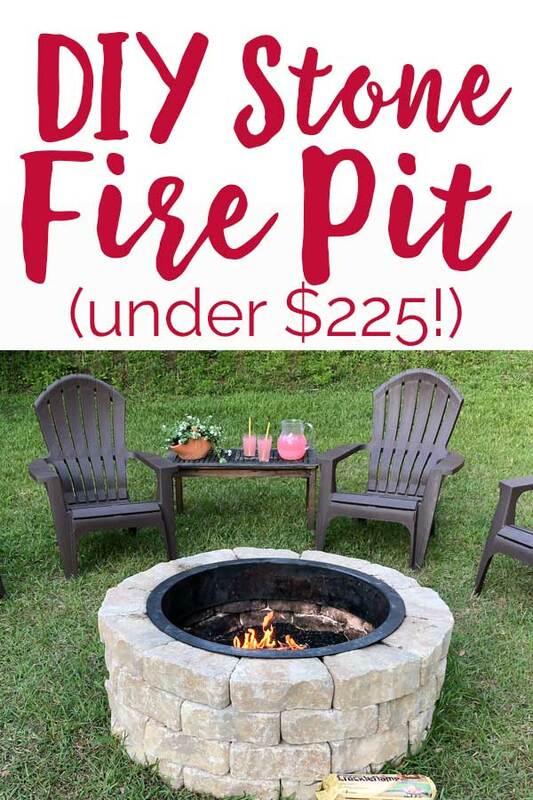 Now that we are settled down into what we hope will be our “forever” home we really wanted to build a more permanent fire pit in the yard. 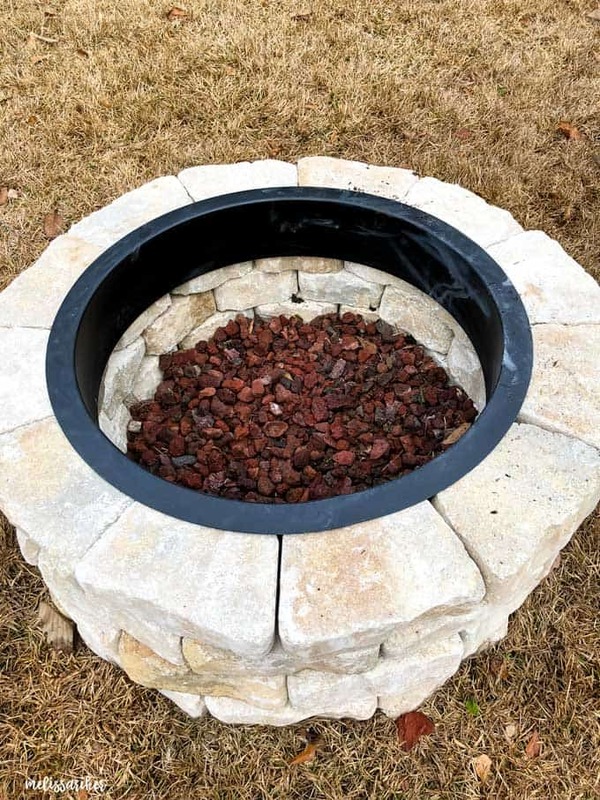 We were pleasantly surprised when we found a fire pit kit at our local big-box home improvement store that included the stones and metal ring for $200. We read up about the install online and found that it was recommended to add an extra row of stones for more height so we opted to buy 12 extra matching stones along with the kit. (They were about $1.50 a piece so this added $18.00 to the project.) We also already had lava rock on hand to use for the bottom of the pit area. 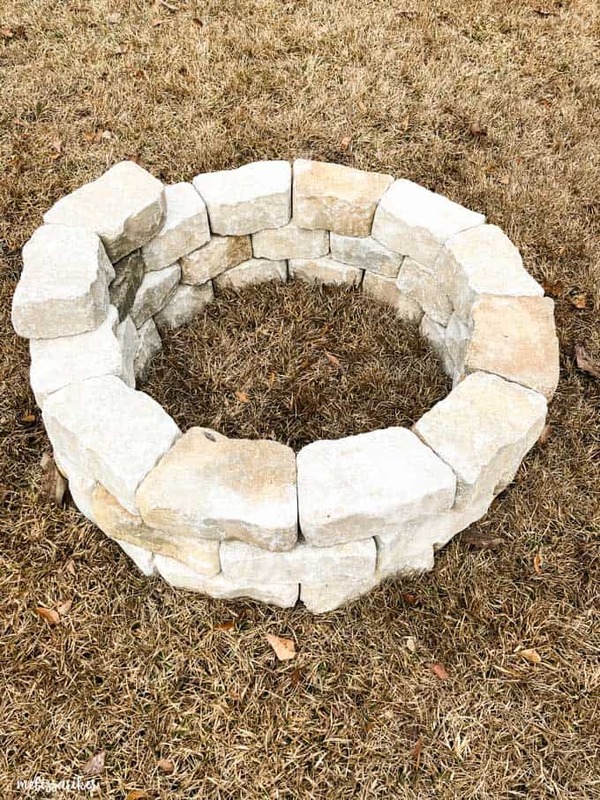 The first step was to choose where in the yard to place the fire pit. We chose an area off to the side of the yard that did not get much use but was still close to the patio and our hot tub area. We measured out the width of the fire pit, decided on exact placement, and got to work! The stones fit together very easily making it almost unnecessary to measure as we stacked them. We were careful to stagger the stones as well and try to distribute the darker stones evenly among the lighter colored ones. I was very happy we opted for the extra row of stones, the kit allowed for three layers but the fourth added some nice height to it and gave a more custom finished look. 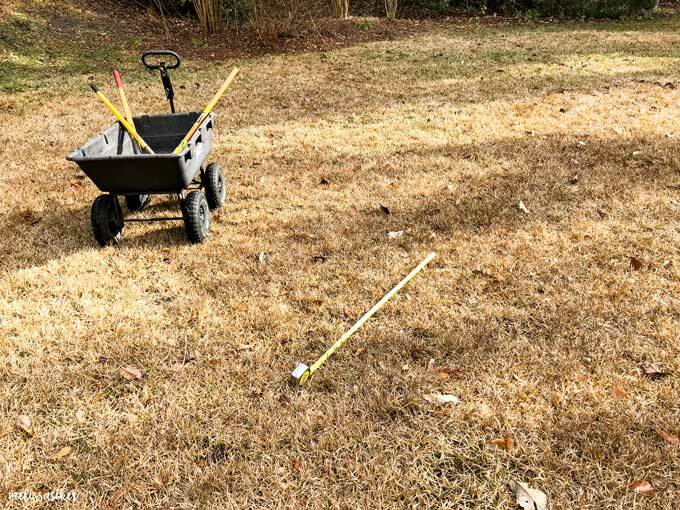 It was at this point I realized I should have removed the sod first! It would have been easier but we were able to get it removed and layer about 4″ of lava rock along the bottom of the fire pit to form a buffer between the fire and ground. The finishing touch was to add the metal casing and we were all finished in less than two hours! 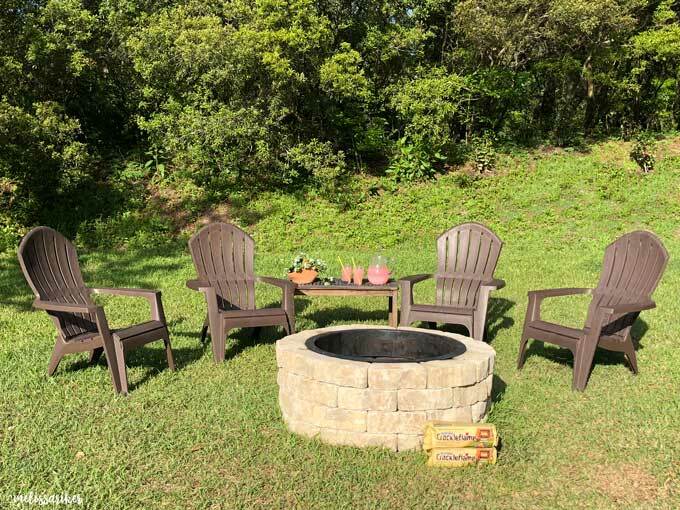 Talk about a satisfying outdoor project and for under $225! I, of course, couldn’t wait to test it out with a Duraflame® Crackleflame log! I always keep Duraflame logs on hand so we can enjoy an outdoor fire anytime-no searching for kindling or dry wood, just pop the log in the fire pit, light at the two marks on the wrapper, and have a glowing fire five minutes later. It’s too easy! I also love that it has 80% less emissions than a typical wood fire. I use the Crackleflame logs when we are enjoying the fire for ambiance because I love the sound of them, and the Duraflame Campfire Roasting Logs if we plan on making s’mores as they are food friendly! We literally enjoy our new firepit at least once a week since building it, it’s so nice to be able to enjoy a fire anytime we are in the mood. It’s also been a great place to gather with friends on the weekends for easy, stress-free entertaining. What do you think of the new fire pit? Would you build one in your yard? 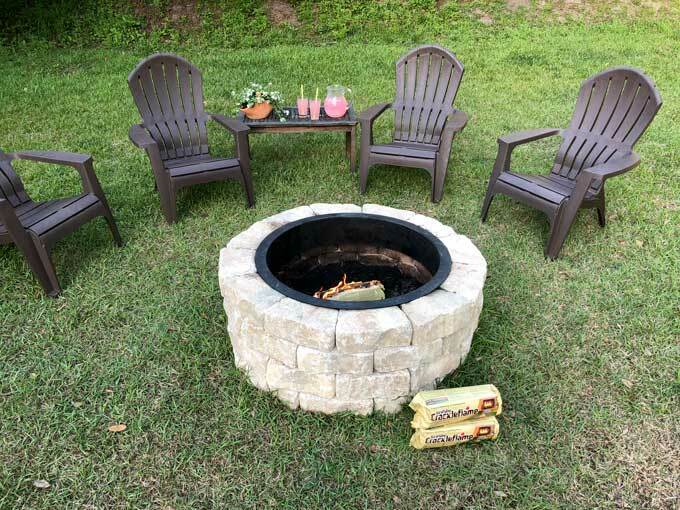 Have you tried Duraflame’s Crackleflame or Campfire Roasting Logs? They make having a fire so easy and convenient!